Friday February 18th 1881 I was helping about the work in the forenoon as Mother had considerable baking to do. She went to town in the afternoon I knit all the afternoon. It was a nice night and we all went to the party at Uncle Jims and had a splendid time. It was very late when we got home. 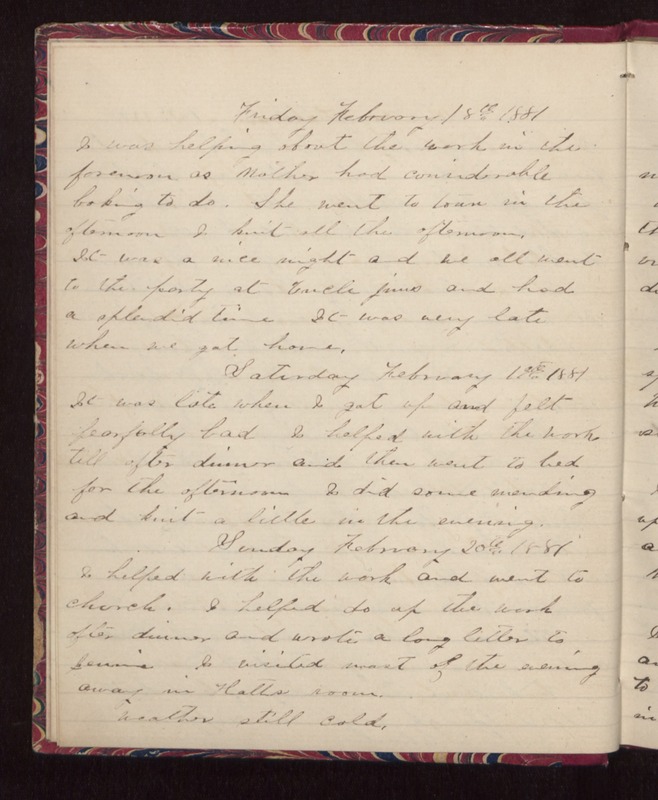 Saturday February 19th 1881 It was late when I got up and felt fearfully bad I helped with the work till after dinner and then went to bed for the afternoon. I did some mending and knit a little in the evening. Sunday February 20th 1881 I helped with the work and went to church. I helped do up the work after dinner and wrote a long letter to Jennie. I visited most of the evening away in Hatts room. Weather still cold.